Anyone approaching Baghdad from the north or the west will be impressed by the sight of the four golden minarets at Kadhmayn, the Shrine of the Two Imams, Imam Musa Al-Kadhim and Imam Muhammad Al-Jawad, peace be upon them. They are respectively the Seventh and the Ninth of the Twelve Imams. Al-Kadhimiya is said to be the oldest towns in Iraq. 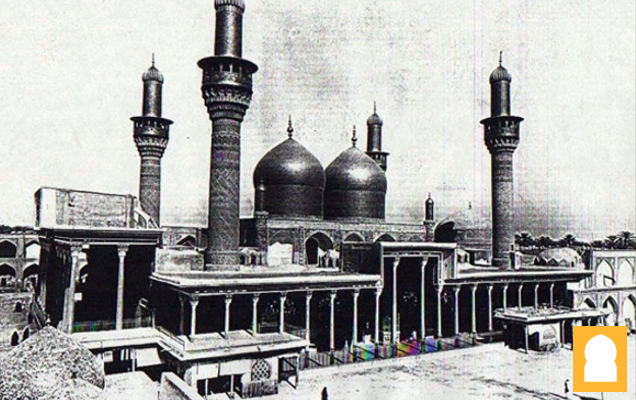 Prior to the construction of Baghdad, Al-Kadhimiya was known as Shoneezi, an Arab name meaning the Black Grain. When the Abbasid Caliph Abu Ja'far Al-Mansour started the construction of the Round City of Baghdad in 762 AD (145 AH). This areas was made into a cemetary for the family of his family and was called Qureish cemetery.whithin this cemetary was burried the holly Imam Musa bin Ja'far also known as Al–Kadhim who died in 799 AD (183 AH) Afterwards, his grandson, Imam Mohammad Al-Jawad who died in 834 AD (219 AH) was buried there. The present building dates back only to the beginning of the sixteenth century and has been kept in excellent repair. This building represents the restoration of Shah lsmail I (1502 - 24), though when the Turkish Sultan, Suleman the Great, captured Baghdad and remained there for four months in 1534, he visited this sacred place, and is said to have contributed to the further ornamentation of the Shrine at Kadhmayn. The mosque is a world famous shrine and said to be one of the most important mosques in the Islamic world. The structure is of exceptional architectural design with a huge gilded dome on a circular drum, there are four minarets coated in gold rising above its court yard (ewan) and Kufic inscriptions are seen all around the mosque. Also buried within this mosque are the two famous historical scholars, Shaykh al Mufid and Shaykh Nasir al-Din Al-Tusi. 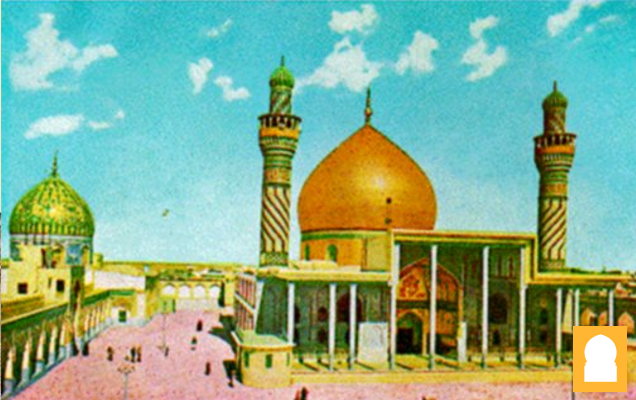 In addition directly adjacent to the shrine are two smaller shrines belonging to two brothers, one belongs to Sayed al Razi who complied Nahjul Balagha. The other belongs to Sayed al Murtatha (Alam al Huda) who was one of the greatest scholars of that time. The modern city of Samarra is located on the bank of the river Tigris approximately sixty miles from the city of Baghdad. The city is of outstanding importance due to it being the home to al-Askari Mosque, the Maqam Ghaybat and the Great Mosque of Samarra. The golden dome on one shrine was presented by Nasr al-Din Shah and completed under Muzaffar al-Din Shah in the year 1905 A.D.The dome was covered in 72,000 gold pieces also beautiful light blue glazed surrounded the walls.The goldendome was approximately 20 m (66 ft) in diameter by 68 m (223 ft) high and took a dominant place in Samara’s skyline. Beneath the golden dome are four graves, those of Imam Ali Al-Naqi the 10th Imam and his son, Imam Hasan Al-Askari who is the 11th Imam. The other two are of Hakimah Khatoon who is the sister of Imam Ali Al-Naqi and the fourth grave belongs to Nargis Khatoon, the mother of Imam Al-Mahdi. The second shrine marks the place where Imam Al-Mahdi went into concealment (Ghaybat). 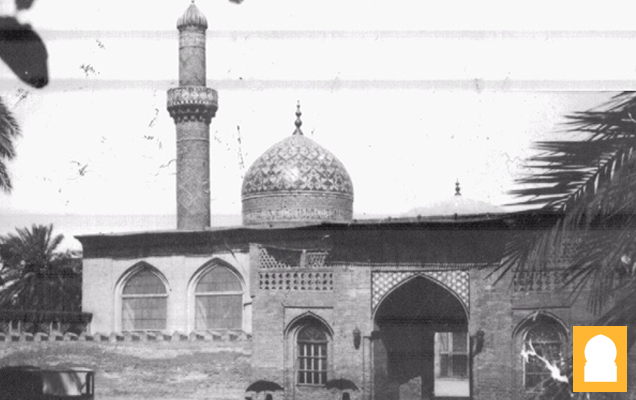 It has a dome that is distinguished for the soft delicate design that is worked in blue tiles, and beneath it is the cellar (sirdab) where the Imam is said to have disappeared. Visitors may enter this Sirdab via some stairs. 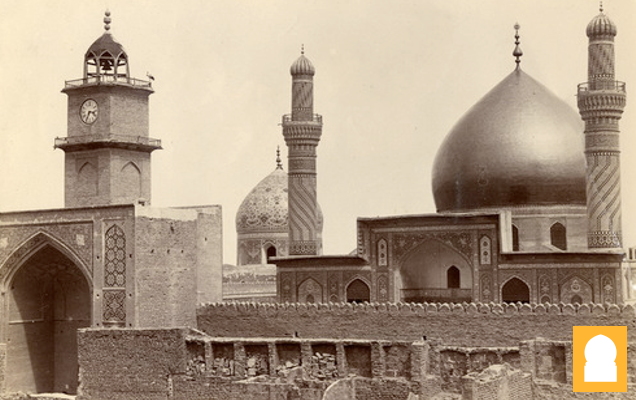 The Imams ‘Ali al-Hadi ("an-Naqi") and Hassan al-‘Askari lived under house arrest in the part of Samarra that had been Caliph al-Mu'tasim's military camp (‘Askaru l-Mu‘tasim) where he aimed to show them the greatness of his army. They died and were buried in their house near the mosque built by Mu‘tasim. It was later discovered that their death was due to being poisoned. Al ‘Askari Mosque (Arabic: Marqad al-Imamayn ‘Ali l-Hadi wa l-Hassan al-‘Askari) is a Muslim holy site and is one of the most important Shi‘a mosques in the world. Unlike any other city, Karbala has its named engraved in the memory of generations, believers remember that name with sorrow and distress, for they remember the history of the master of all martyrs, Imam Husayn, peace be upon him, and his sacrifice for Islam. The Shrine of Husayn ibn Ali is a holy shrine in the city of Karbala, Iraq. It stands on the site of the grave of Husayn ibn Ali, the second grandson of Muhammad, near the place where he was killed during the Battle of Karbala in 680AD. Hundreds of Shia Muslims gather around the Husayn Mosque in Karbala after making the Pilgrimage on foot during Arba'een. Arba'een is a forty day period that commemorates the martyrdom of Husayn bin Ali, grandson of the Prophet Muhammad, and seventy-two of his followers at the Battle of Karbala in the year 680AD.The Umayyad and Abbasid caliphs prevented construction of the shrines and discouraged pilgrimage to the sites.The tomb and its annexes were destroyed by Abbasid caliph Al-Mutawakkil in 850-851 and Shi'a pilgrimage was prohibited, but shrines in Karbala and Najaf were built by the Buwayhid emir 'Adud al-Daula in 979-80. The wave of visitors never stopped coming to Karbala, from the time the Umayyad and Abbaside caliphs prevented the construction of the shrines to the time the believers were able to build the precinct, despite the hardships and difficulties imposed on them. The tomb of Husayn ibn Ali is one of the holiest places for Shi‘as outside of Mecca and Medina, and many make pilgrimages to the site. Every year, millions of pilgrims visit the city to observe ‘Ashura, which marks the anniversary of Husayn ibn ‘Ali's death. Abu al-Fadl Abbas, peace be upon him, was the brother of Imam Hasan and Imam Husayn and the standard-bearer of Imam Husayn [a] in the Battle of Karbala. He is well known in history for his valour, loyalty and similarity to his father, the Lion of God, Ali b. Abi Talib, peace be upon him. The grave of Abbas received similar attention as that of Imam Husayn . In the year 1032 AH, the King Tahmaseb ordered the decoration of the grave's dome. He built a window on the 'darih' around the grave and organized the precinct. Other similar activities were done by other rulers. Karbala contains not only the grave of Imam Husayn and his brother but the graves of all the 72 martyrs of Karbala. They were buried in a mass grave which was then covered with soil to the ground level. This mass grave is at the foot of Imam Husayn. To the side of Imam Husayn are the the graves of his two sons Ali Akbar and 6-month old Ali Asgher. In the 40th year of Hijrah, in the hours of the morning of 19th Ramadan, 'Ali was struck with a poisoned sword while offering his prayers in the mosque of Kufah. The Lion of God, the most brave-hearted Muslim that ever lived began his glorious life with devotion to Allah and His Apostle and ended it in the service of Islam. The Imam Ali Holy Shrine also known as Masjid Ali or the Mosque of Ali, located in Najaf in Iraq, is the third Islamic holiest site according to the Shia branch of Islam. Buried next to Imam Ali within this mosque are the remains of Adam and Noah. The Mausoleum itself of Hazrat Ali is breathtaking. There is one large central dome which stands out of a square-shaped ornate structure at the two sides of which are two minarets. The holy shrine is considered to be one of great masterpieces of Islamic art and heritage. In addition to the materialistic value it includes many of an outstanding artistic value of gold and silver artwork and inlay of multi-coloured enamel. Countless number of people from all over the world flock to his tomb day after day to pay their respects and to offer salutations and to pray to Allah seeking his intercession. 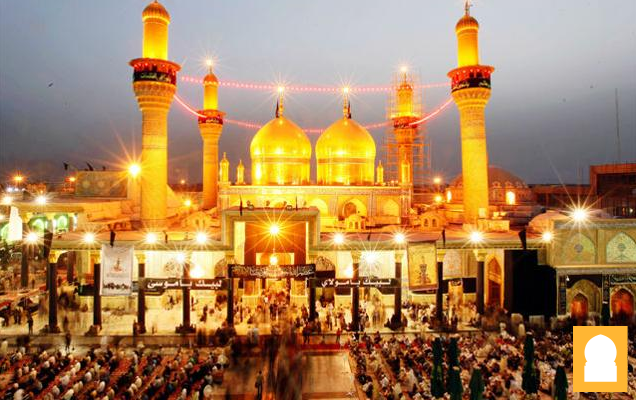 And those who cannot afford to go there personally, are constantly praying to Allah to help them to visit the shrine of their Imam, and when somebody goes on a pilgrimage to Najaf, they request him to offer salutations on their behalf and to pray to God and to seek Imam Ali's intercession. This mosque in Al-Aadhameyya was built over the shrine of Imam Abu Hanifa (Al-Nu'man bin Thabit Al-Kufi), who gave his name to the Hanafites. He was buried in Al-Khaizuran cemeteries in 767 AD (150 AH), whereupon a small township grew up around the shrine called Mahallat Abi Hanifa and the district became to be known as the district of Abu Hanifa and Al-Aadhameyya. Three hundred years later, in 1066, the Seljuk Sharaful Mulk Abu Said Al-Khuwarazmi renovated the shrine, built a large dome over it, and built a Hanafite school nearby.The building went into cycles of change, destruction and reconstruction over the centuries, and was renovated by Ottoman Sultans and Walis several times. Nowadays, its huge dome is covered with neat Golden Aluminum plates and it has a clock renown of its accuracy.